Some of the other OBR videos that really captured my heart. Reframing: This is a powerful motivational tool. Reframing our language helps us to influence the “inner movies” that we and others see in our minds. This can make a huge difference in how others perceive us and what we’re telling them. This is also true with family and friends. This truly can help “Make Friends and Influence People”. Because of our caveman, our immediate gut reactions are often to focus on risks and only see problems. This can blurt out “caveman comments” that activate F Responses in others. Going Positive reframes create inner movies in people’s minds of the goals and the action needed to reach them. They also inspire the emotion needed to motivate people to action. Wendy and Kevin, of the Litle & Co’s Leadership University class of 2012, give real-life examples of how they use reframes for great leadership. Here are some other great examples of wonderful reframes from one of Litle’s stars. More will follow in later posts. We talked about caveman behaviors and thinking behaviors, positive and negative comments and even about our Inner Movie. Caveman and Thinking behaviors seem to resonate the most with Susan. We agreed going forward when we got upset with each other or saw caveman behavior in each other we would use a shared “code word” as a reminder to reframe and choose our words more carefully. Susan picked our code word: octopus flare. I agreed it was good choice and would definitely snap me out of my caveman moment! We’ve reference the caveman and thinker throughout this week since our lesson – and our code word is definitely working. It’s impossible NOT to smile (and laugh) when you’re saying/hearing octopus flare! Over the course of this week we’ve talked each night about different segments of the training. Slightly different from my lesson with Susan, John and I have focused more on inner movie, reframing and 10:1 positive to negative comments. And our greatest challenge: TONE. We both realize an opportunity to reframe our communications with the girls to be more in line with the 10:1 positive to negative comments. Most obvious has been our combined efforts to shift from telling them what NOT to do and reframing it into HOW to do something differently. We also talked about the Chameleon Effect. Specifically making judgments/assumptions about the girl’s abilities or presumed limitations (our inner movies perhaps?) and allowing that to guide our approach with them. The story of the teacher with gifted/non-gifted children really hit home on the potential negative ramifications. I. Caveman Urge: I wanted to ask a team member what they were thinking (sarcastically and with annoyance!!!) offering a client a free trial after we’d already offered the trial as a risk free trial (pay for service upfront with a money back guarantee). Reframe: I checked my temper and my inner movie and took the time to ask some qualifying questions about what conversations led up to the discussion and how the offer evolved. Result: Instead of letting my caveman loose and my temper run wild, I asked questions and took time to listen and understand how the situation evolved. In doing so I learned the team member was inadvertently not included in several key discussions leading up to the client call, limiting their insight and resulting in lack of direction. I took the opportunity to review the sequence of events, apologize for my oversight in the process and offer positive observations on where the team member took initiative and responsibility to move the opportunity forward. II. Caveman Urge: My seven year old daughter, Ellen, is having some trouble with separation anxiety in the morning before going to school. I wanted to tell her not to be sad and to focus on happy things versus how much she misses mommy and daddy during the day. Reframe: I remembered that referencing the feelings of sadness and missing us would bring up the feelings/thoughts that caused her to be upset in the first place. So instead I said, “I feel like today is going to be a great day!” and steered the conversation toward activities happening that day that I knew she liked (e.g. gym, recess, etc.). Results: The first day it took a lot of reframing/redirecting and we still had some tears. Today she was less focused on sadness/missing and more focused on feeling like it would be a good day. Reframe: I stopped to consider how my previous comments along those lines had failed to make any difference in our morning routine, and potential for conflict. I thanked Susan for making her bed that morning before being asked and asked her what else was needed done before we headed out to the bus stop. Results: Susan brushed her teeth and her hair without further prompting and I kept my anxiety (and unnecessary caveman comments) to myself. That night before bed we talked about ideas of things we could do to make getting ready in the morning smoother and less rushed and agreed to set our clothes out the night before. I love helping people transform their lives. I love it so much, I often do it for free. I am on the board of directors of Vital Cycles, and do a lot of volunteering with trauma survivors. 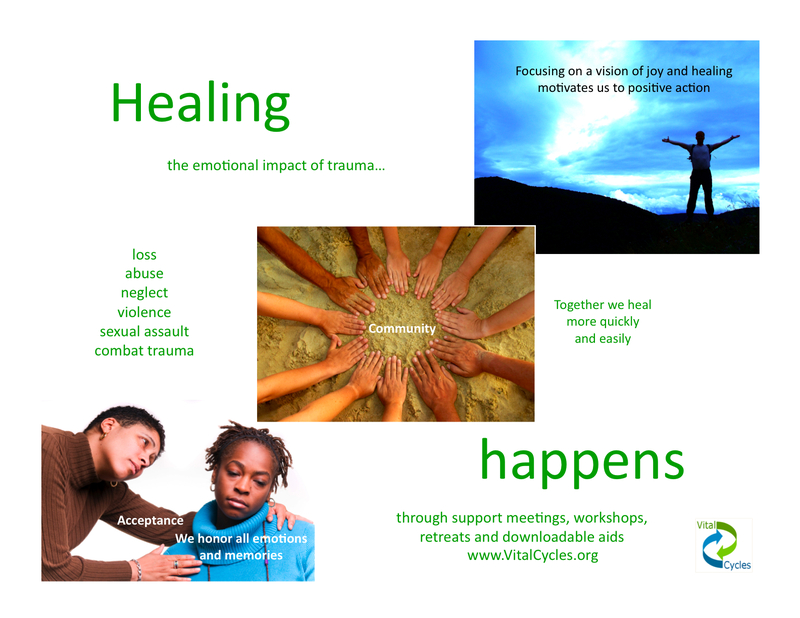 The purpose of Vital Cycles is to empower those who seek joy in living while healing the impacts of emotional trauma. I was just interviewed on a blogradio program talking at length about trauma, how Vital Cycles helps and other resources for those that deal with emotional trauma. If you’re interested in hearing the recording click here. Who knew that Going Positive could have so many great results. Here is a wonderful speaker talking about great research showing so many advantages to smiling often! This is my favorite thing to teach. Being able to positively influence oneself is a critical skill for anyone increasing success, happiness, and even health. There will be more videos teaching how to apply these concepts and tools in your life. I was honored to be interviewed for Peter Sterlacci‘s video blog last week. In his view, part of what I do is what he calls a “Personal Brand Mechanic”. I talk about the Caveman and the Thinker and how to get them both engaged both in living your personal brand, and in creating positive change in general.